The great David Fincher has produced a new serial killer series for Netflix, and it looks terrifyingly good. The iconic director and producer is well known for telling psychologically compelling crime stories, and Mindhunter looks to be as ambitious and complicated as anything he has crafted for the silver screen. Much like his 2007 murderous masterpiece Zodiac, this new drama is based on book material, drawing from John Douglas’ crime classic Mind Hunter: Inside the FBI’s Elite Serial Crime Unit . 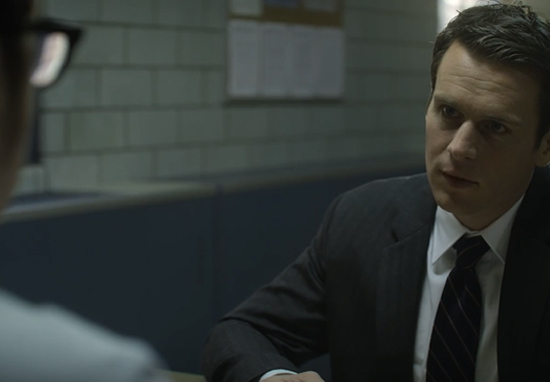 The plot follows two 1970s FBI agents Holden Ford (Jonathan Groff) and Bill Tench (Holt McCallany) as they grapple to understand the shadowy psyches of the vicious serial killers they work with. The series examines the question ‘How do we get ahead of crazy if we don’t know how crazy thinks?’, while looking at the terror and discomfort of those who dare to look into the minds of evil. The trailer opens with a blood curdling monologue from a sadistic murderer about the difficulties of ‘butchering’ people, signalling that this will be a very intense exploration of the darker side of human nature. No biggie but #Mindhunter premieres in…92 days. Anyways I'm trying to power thru as many of these shows as I can myself before Mindhunter, cuz after that who knows what state I'll be in. Fincher has directed the pilot episode, with other directors for the series including Asif Kapadia, Tobias Lindholm and Andrew Douglas. Will Mindhunter reach the dizzyingly popular heights of the Fincher produced House of Cards? For now, we must just wait and see, but with a second series already being announced, things are looking promising.